The Lost Boys reshaped some of the things that a vampire was back in the 80's and a lot of those things follow through to later movies. The movie follows brothers Sam and Michael to Santa Carla, when things start to change. After meeting a strange woman named Starr and her 'friends' the older brother Michael starts sleeping all day, staying out all night, and giving a lot of attitude. It Also Gave Us Amazing Hair Styles. Little does Sam know; that his new friends the Frog brothers know more about creatures of the night than the stories can tell you. 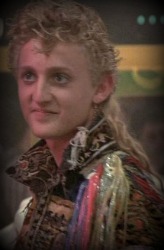 What can I say about Lost Boys? Lots, but that would ruin the movie that you are going to see after you are finished here; that or it would be everything you already know. Over 25 years ago Joel Schumacher (St Elmo's Fire, Phantom of the Opera) undertook a revolutionary vampire movie. That movie was "The Lost Boys" initially meant to be a sequel to "The Lost Girls" which was written, but never produced. This is the movie where you first 'really' heard of Kiefer Southerland, Corey Haim and Corey Feldman. It was the vampire movie of the 80's and most of the 90's. Just watching it will send you right back to the 1980's. With costume designs that are classic 80's; looking back at it now, people that dressed 'cool' or 'like a badass' then, would get beat up now for dressing like that. He was a badass in the 80's, now he would be stuffed in a locker. Anyway; to give you a taste of what to expect when you watch this movie, amazing effects for the time and still very passable even by today’s standards. The makeup, costume design, and effects are a couple notches above what they do on Buffy the Vampire Slayer TV series, or Angel. The writing is also mostly timeless, if it were not for the costume design and very few pop culture references at the time (Such as 1 mention of an old soap opera) the plot and story would still fly in theaters today. Now, let’s get into the acting; it’s not bad for a movie performed in the 80's by young kids, and that is for the most part what you need to keep in mind. Corey and Corey are rather young, and most of the cast is under 20 except for the parents who get only a little screen time, and grandpa who gets even less. 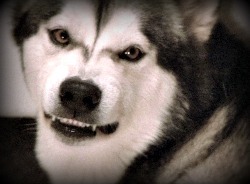 If you don't want to know more about the movie than the little vague bit up top, scroll down now, and don't stop until you are past the picture of the malamute (Nanook in the movie!) before you start reading again. To share with you a little bit about the movie itself, Sam, his brother, and his recently divorced mother move to what I assume is somewhere in California. Where within only a couple days they run up against the dirt bike riding punk group of kids who turn out to be more than just a little bit of trouble. While Sam's brother gets into the wrong crowd, Sam makes friends with the Frog brothers, self-proclaimed vampire hunters, and employees at the local comic book store. Things spiral downhill after Sam's brother has a wild night out with his new friends who convince him to do all sorts of crazy things, from leaping off of train tracks, driving at high speeds along deadly hillside passes, and even drinking blood. Shortly after that Michael starts sleepnig all day, staying out all night, and strange things start happening around the house. When the Frog brothers reveal that Sam's brother has become a vampire, the three set out to save Michael by trying to kill the lead vampire. A task that does not come easy for the young boys given the distance, and limited mobility of the vampires hideout. The clock is ticking for Michael; if he, the Frog brothers, Starr, and Sam can not stop the vampire gang soon, Michael will have fallen in with the wrong crowd forever. With a great plot, great acting, the only thing that is missing is great music right? Well, they covered that too when they produced the soundtrack. I own very few movie soundtracks, this one, "The Crow", "The Crow 2" as well as "Interview With The Vampire" And a couple others. They hired some of the greatest talent of the time to produce music for the movie, including the haunting "Cry Little Sister" That has been featured, and covered in every Lost Boys movie created. So, the first vampire movie for a entire generation, the 'starting point' for what all vampire movies 'should be' and the bench mark for almost 2 generations of vampire movie lovers. 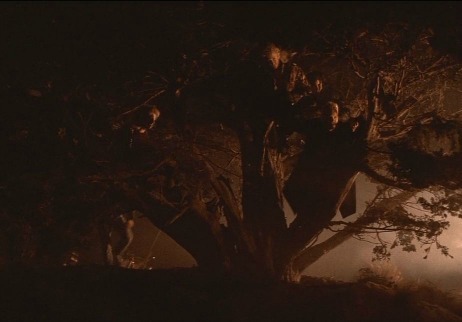 Lost Boys combines an amazing soundtrack visuals that are still used today, but now in television instead of blockbuster movies, and a great cast; it has it all. You can Purchase The Lost Boys on DVD or on Blu-Ray Disk or even Direct Download From Amazon . 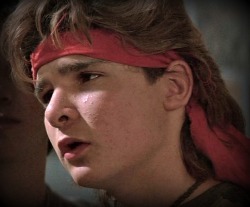 But no matter how you choose to see The Lost Boys. Watch it, if you have seen it before, watch it again. For better or worse, it is one of the building blocks of modern day vampire movies.